Shippers and carriers sometimes might disagree on fair rates, settlement schedules or detention charges. But there is one freight-hauling technique that wins kudos from both sides: drop and hook. It sounds easy — and it can be — if the timing is right, experts said. At a 43-door distribution and manufacturing center belonging to Revlon Inc. in Oxford, N.C., trucks arrive and drop trailers loaded with bulk materials or components. They then hook up other trailers filled with finished products and move on — pulling in and out anywhere from 6 a.m. to midnight, said Sherry Ennis, transportation manager for Revlon Consumer Products Corp.
“That’s the way my business runs. If everything runs smoothly, that’s always going to be the case,” Ennis told Transport Topics. 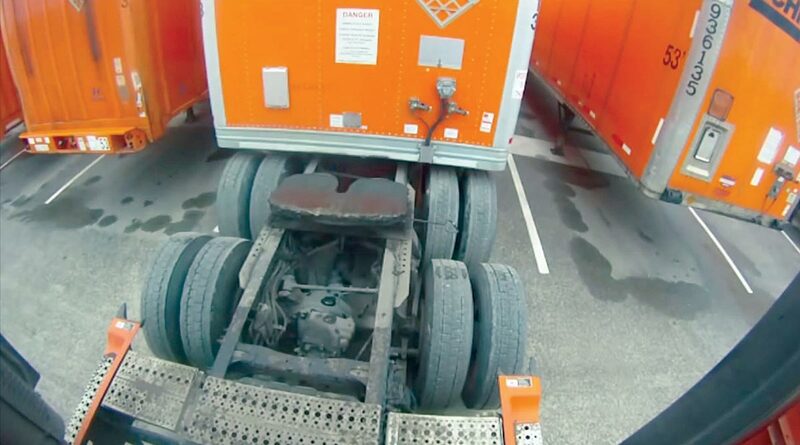 What can mess up the drop-and-hook process is if a shipper doesn’t unload the inbound freight. That means there are no outbound trailers to load. When the carrier arrives, it may have to bobtail away without a trailer attached, then return once the trailer is ready, said Ennis, who has been moving freight for 24 years. Smaller, regional carriers are her preferred partners for developing a network with consis- tent loads. “I find when you have a small regional truckload carrier, they are apt to do what needs to be done, and you can build a better relationship than with a larger national carrier, where you are not as significant or important to them,” Ennis said. Where companies can plan their demand, “the use of drop and hook is expanding,” said Terri Reid, director of supply chain and transportation at footwear manufacturer Caleres Inc., formerly known as Brown Shoe Co. Caleres’ products are distributed in more than 2,500 retailers in the United States and Canada and 60 countries worldwide, according to the company. Reid, speaking as president of the National Shippers Strategic Transportation Council, or Nasstrac, said she thinks drop and hook will resurface “as one of those old-new techniques,” noting it offers several benefits to shippers. Shippers also avoid costly charges for driver detention at their docks and can load trailers at their convenience. Plus, drivers typically bring an empty trailer when picking up a load, so that cycle ensures empty trailers always are available, Reid said. “Drop-and-hook systems mean the days of live-loading trailers and missing appointments are over, which is more cost-effective for everyone involved in the supply chain,” Reid said. Meanwhile, recent online ads for truck drivers placed by industry giants UPS Freight, the less-than-truckload arm of UPS Inc., and Amazon Transportation Services, the trucking division of online retailer Amazon.com, mention drop and hook as an inducement for drivers to work for them. UPS ranks No. 1 on the Transport Topics Top 100 list of the largest U.S. and Canadian for-hire carriers. “Drivers just want to be drivers,” said Gary Petty, CEO of the National Private Truck Council. The average private-fleet driver spends 35% of his or her time in nondriving functions, and that generally means they are unloading or helping set up the load they are delivering, he said. The Anderson, Ind.-based company said it matches private and dedicated fleets’ underutilized backhaul capacity with consistent freight from shippers in convenient shipping lanes. In addition, the less time spent unloading and loading, the less likely drivers will exceed the limits imposed on them by federal hours-of-service rules, which regulate when and for how long a driver may drive, he said. About 90% of the shippers he works with prefer drop and hook, which usually takes about 30 minutes to complete, DiEgidio said. Sometimes, however, drop and hook can be less than immediate and require pre-positioning an empty trailer. It is left, and the carrier returns when it is loaded. That modified approach has a cost that shippers must appreciate, said Stephen Brown, president of Ross Express, a less-than-truckload carrier in Penacook, N.H.
Shippers all like a drop-and-hook situation, he said. There are, however, other financial considerations. “What shippers sometimes fail to understand is there is a cost to the carrier in terms of the mileage and the fuel and the labor that you spend dropping and hooking, depending on how close the drop and hook is to your own service center,” Brown said. When Ross Express lets them know it can drop and hook but at an additional $70 an hour plus the fuel, “sometimes that changes the dynamic of the conversation,” Brown said. “And all of a sudden, they don’t want the drop and hook, and say, ‘Can you can pick it up at 10 o’clock tomorrow morning?’?” he said. But for another customer, Ross Express drops a trailer every night at 11 p.m. empty, picks up a full one and gets it into his system for distribution. “That is a negotiated rate up front and all blended in with the LTL delivery,” Brown said. Timing is especially important at Ross Express because its “sell” is overnight service in New England, Brown said. That adds “a little more pressure on us because we have to get that freight back to the service center,” he said. Another important aspect of the drop-and-hook process is for a carrier to have a shipper’s load-and-count agreement outlining responsibilities for any damages, said Doug Hawley, national account executive at Dohrn Transfer Co. a diversified motor car- rier in Rock island, Ill., and unit of Hammels Cos.
E-mails are exchanged the next morning after a trailer is delivered if there are exceptions in the condition of the load, Hawley said. Dohrn Transfer offers full coverage in Illinois, Iowa, Indiana, Missouri, Nebraska and Wisconsin. It offers partial coverage in Kansas, Kentucky, Minnesota and South Dakota. The Code of Federal Regulations dealing with transportation describes when a carrier is not liable for damages. “A common carrier issuing a bill of lading is not liable for dam- ages caused by improper loading if (1) the shipper loads the goods; and (2) the bill contains the words ‘shipper’s weight, load, and count’ or words of the same meaning indicating the shipper loaded the goods,” according to the regulation.